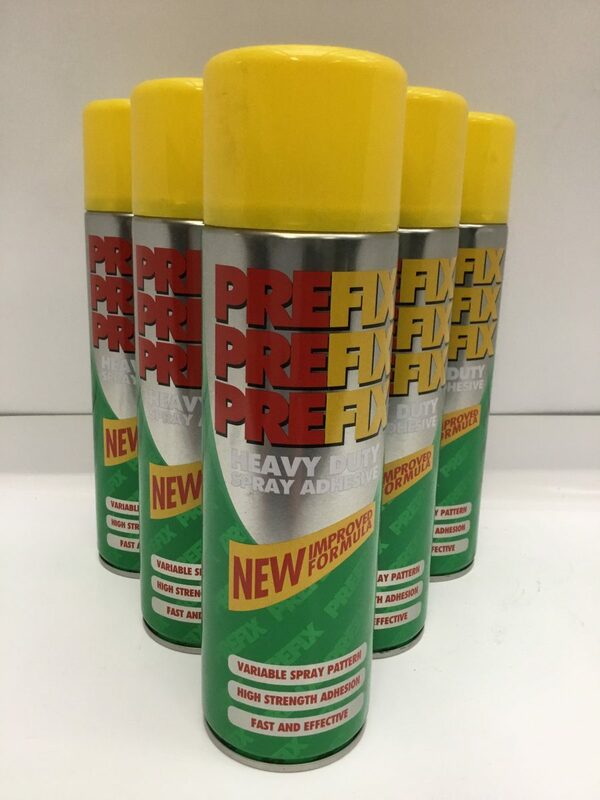 Prefix is a multi purpose spray adhesive designed to perform a variety of bonding tasks. Flooring – Particularly suitable for fixing foam and felt backed carpets, carpet tiles and underlays. Upholstery – Ideal for bonding most upholstery materials to themselves and to each other including foams, fabrics and leather. Automotive – For use in fitting vehicle interior carpets etc. Not suitable for vehicle headlinings. Ensure that surfaces are clean, dry and dirt free. For a strong bond spray a number of light coats onto both surfaces. For a lighter bond apply to one surface only. Allow a few moments for the solvent to evaporate. Press surfaces together firmly, working outwards to achieve a good bond. When finished invert the can and spray for a few seconds to clear the nozzle.